My initial investment was small(ish). I purchased a refurbished Nikon D3100 off Amazon. I quickly learned, however, that if I wanted the "blurry background" I coveted of professional images (also known as bokeh), I needed to invest in a good lens. Lenses are what make the difference. Of course a $3,000 camera will take a better picture than a $400 camera, but with a great lens, you can get a hell of a lot closer! 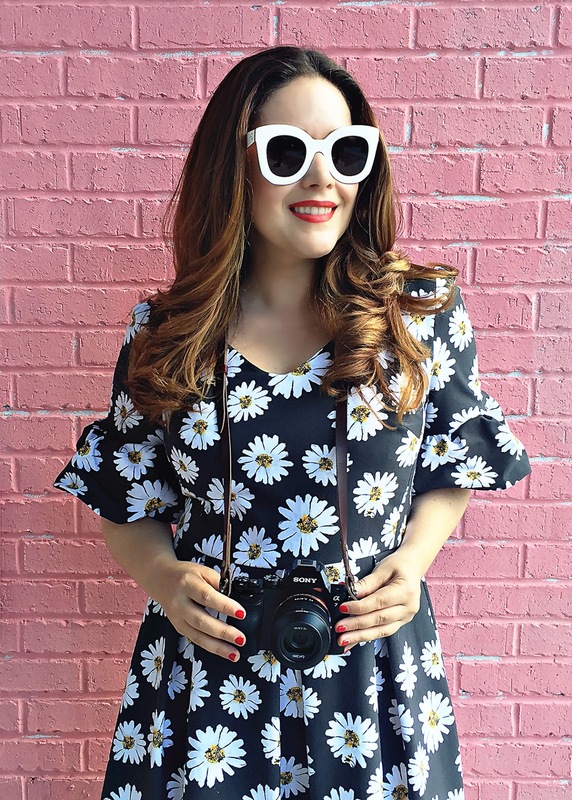 To get a blurry background, the hallmark of the fashion blogger photo, you want a lens with a low aperture. My first low aperture lens was this Nikor 50mm 1.8G lens (that 1.8 is how low the aperture will go). After a year of shooting with a 50mm on a camera that was not full frame, I decided to invest in the 35mm Sigma Art lens. Now, this one was an investment, but what a difference it made. The difference between the 35 and 50mm is the focal length. Both are prime lenses (a fancy way of saying they don't zoom in or out), but the 35mm has a longer focal length. Simply put from the same spot, you might only get my upper body shooting with a 50mm, but from that same spot with a 35mm you might be able to get my entire body. After a couple trials and lots of internet researching, I pretty much had my heart set on upgrading to the Nikon D610. My rational - It's full frame, has better focusing sensors, and will work with the lenses I already own. Then Kelly and I popped into our local Best Buy to purchase (Kelly was set on the Canon 6D, which is Canon's version of the Nikon D610). While there, however, we met an associate named Emmett who made us doubt every decision we had ever made. Emmett introduced us to Sony's line of mirrorless, full-frame cameras, the A7, A7r, and A7rii. I was an easier sell than Kelly, because Sony's new technology gave me everything I wanted in a camera AND it was smaller and lighter weight, which is perfect for travel. The Sony also has this amazing focusing tool called peaking, that I instantly loved. Basically, he explained how all three cameras, the Nikon D610, Canon 6D, and Sony A7, were all capable of producing the same image. Once I conquered my fear of the unknown, I was completely sold on the Sony. I have had the camera for a couple weeks now and it is amazing! And bonus, with an adaptor, I can use all of my old Nikon lenses. If you are looking for a good camera for blogging that won't break the bank, I highly recommend it. It is also a great and less-expensive alternative to the more well known Leica mirrorless cameras. If your like me then your search for a blog camera likely started with Googling "best camera for blogging." Let me tell you, those results were overwhelming and not helpful. While I am far from a professional, I feel like I have learned a ton and hopefully sharing my experiences and what I learned along the way can help someone else.